Radley Parish Council installed three defibrillators in the village, aided by grants from British Heart Foundation and Radley Village Shop. In an emergency ALWAYS dial 999 first! In the case of a suspected cardiac arrest, time is of the essence and you must dial 999 before attempting to locate your nearest AED. Alternative number: You can also dial 112 from any mobile number, anywhere in Europe (and most parts of the world) and this will also transfer you to the appropriate emergency services. Dialling 112 will also triangulate your position to the emergency services so they can accurately pin point your location if necessary. 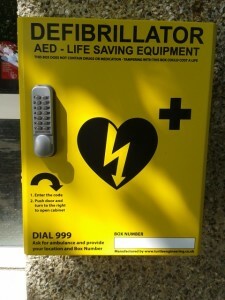 The generosity of the Village Shop and the British Heart Foundation, the Parish Council has meant that has been able to install three Public Access Defibrillators around the village. You will already have seen the yellow cabinets on the village shop, the village hall and the Pebble Hill site office, and the Parish Council is grateful to all three organisations for agreeing to host them. Particular thanks are due to the Village Shop association members who voted to donate the full cost of the defibrillator and cabinet and installed them on the shop for the benefit of residents.